Yes, yes, yes! Know what I mean? 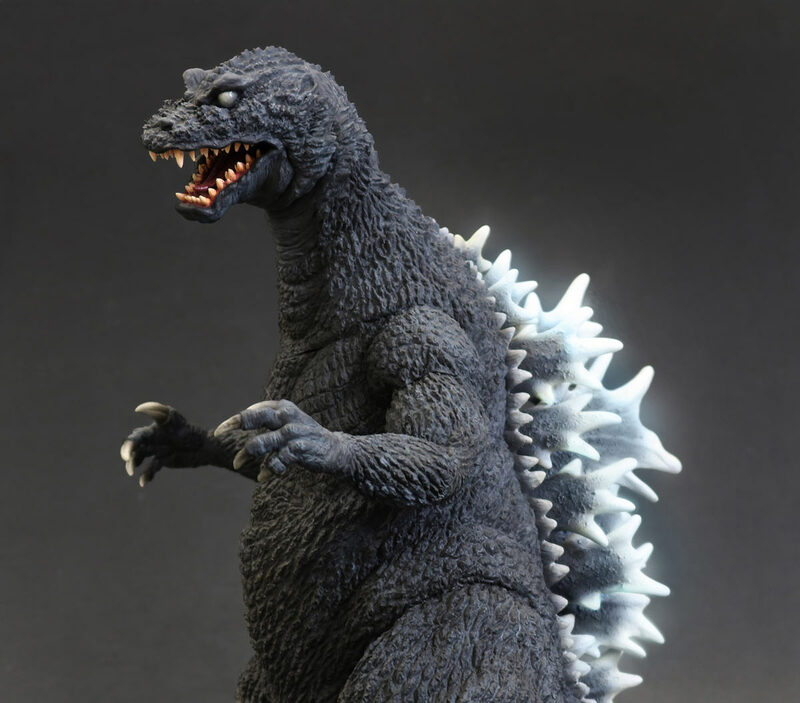 Leslie Chambers reviews the Toho Favorite Sculptors Line Large Monster Series Mothra 2001 & Baragon 2001 (FAVORITE SCULPTORS LINE 東宝大怪獣シリーズ「モスラ(2001)&バラゴン(2001)」) vinyl figure set by X-Plus. It was released in February 2018. 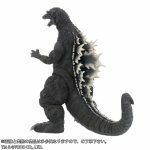 The preorder window for the Favorite Sculptors Line Toho Large Monster Series Godzilla 2001 vinyl figure by X-Plus is finally open. This vinyl is from a previous Monster Maker 28 (MM-28) kit and has been slightly modified by the original sculptor, Shunsuke Niwa for the X-Plus vinyl version. It comes from the same series that brought us the recent Large Monster Series King Ghidorah 2001 and the Mothra 2001 & Baragon 2001 set. X-Plus reports that this figure is 28cm tall (about 11 inches). 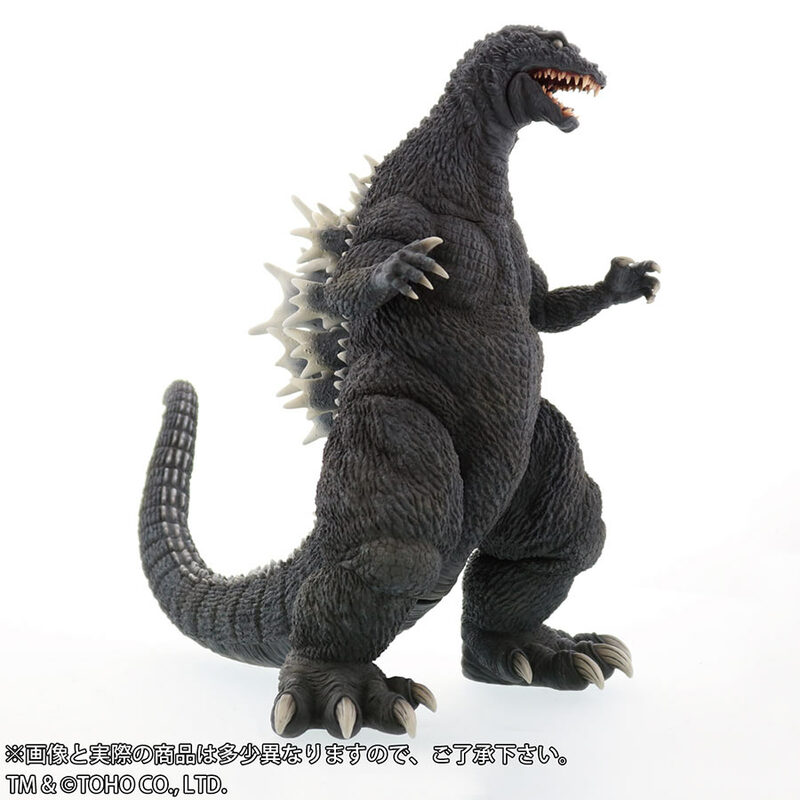 That’s practically the same height as the Yuji Sakai Modeling Collection Godzilla 2001. If you already have the Sakai, you may want to pair it with the rest of your GMK vinyls and skip this new release. But keep in mind this new figure was made to stand with the others in the set. A RIC Exclusive version will feature light-up fins and cost ¥17,820 (currently $164). Reservations started today, February 9, and will end on February 26 at 6pm (Japan time). You can order the RIC version from the X-Plus site. • AmiAmi.com – ¥13,980 ($129.59). • Hobby Link Japan – ¥15,500 ($150.61). Expected release is April 2018. I originally talked about this new GMK, as well as it’s place with the other GMK figures in this December episode of Kaiju Addicts TV. 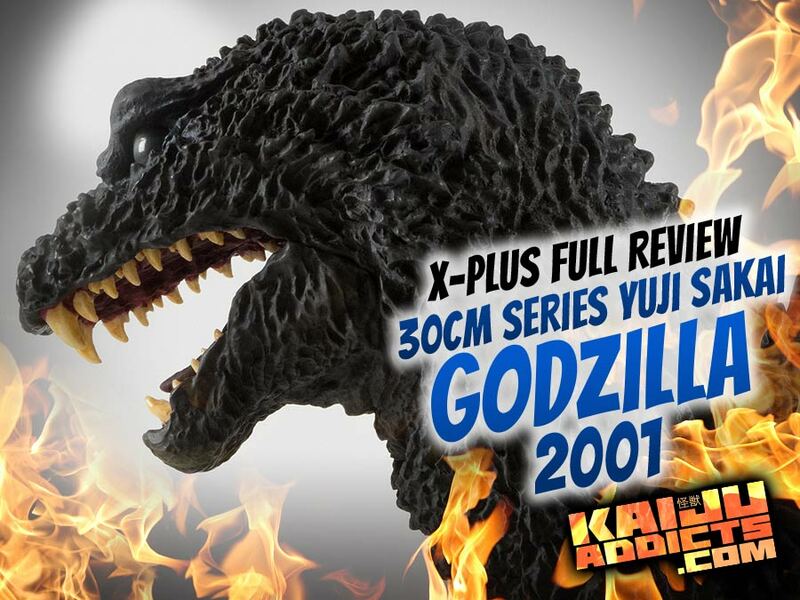 The Yuji Sakai celebration continues with the upcoming release of the X-Plus 12in Series Yuji Sakai Godzilla 2001 vinyl figure, a re-issue of the Toho 30cm Series Yuji Sakai Modeling Collection Godzilla 2001 which was originally released in Japan last year. This re-issue is being made available to stores in the United States and Canada only. And thanks to the arrangement between X-Plus and Diamond Distributors, you can order one of these vinyl masterpieces from your local comic store or favorite online store. At Flossie’s Gifts & Collectibles, we have several pre-orders still available. This figure has a suggested retail price of $230. But you can grab one from Flossie’s for only $179.99 plus shipping. That’s $50 off! 3-Month Payment Plans are available if needed. Email me for details or just read about it on the Sakai 2001 page at the Flossie’s website. They start shipping in under two weeks. Time for you to start watching your email for a note from the store you ordered from or to give your comic store a call to see if they’re on top of things. 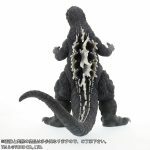 Leslie Chambers reviews the Gigantic Series Godzilla 2001 (2016) Blue Fins Emission Image Version vinyl figure by X-Plus. He also compares it side by side with the original release. This figure is set to be reissued in North America through Diamond Distributors. It originally had a release date of January 2017, but the release was pushed back a few months. You can pre-order one now at Flossie’s. 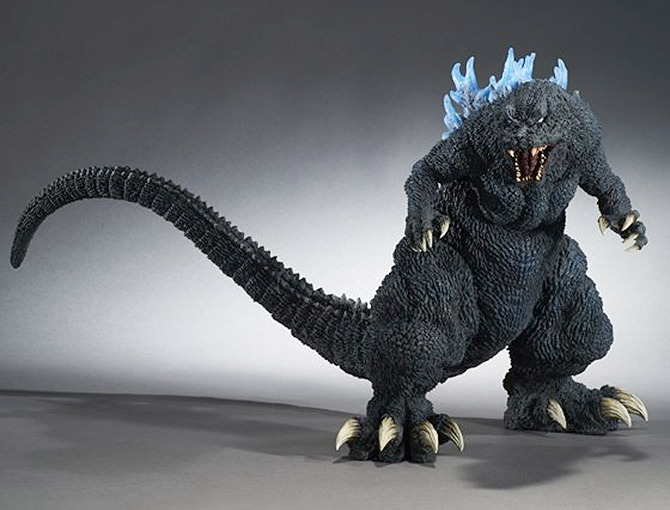 The Gigantic Series Godzilla 2001 Blue Fin Emission Version North American reissue (coming from X-Plus and Diamond Distributors) which was originally planned for release this month in the U.S. has been delayed. Diamond has changed the release date to “To Be Decided” because as of now, X-Plus is unable to provide a firm shipping date. Note that it takes a cargo ship about one month to cross the Pacific in good weather; about a month and a half with bad weather. X-Plus Gigantic GMK gets re-issued… AGAIN! This time it’s just for North America. This is yet another chance to add this beast to your collection! 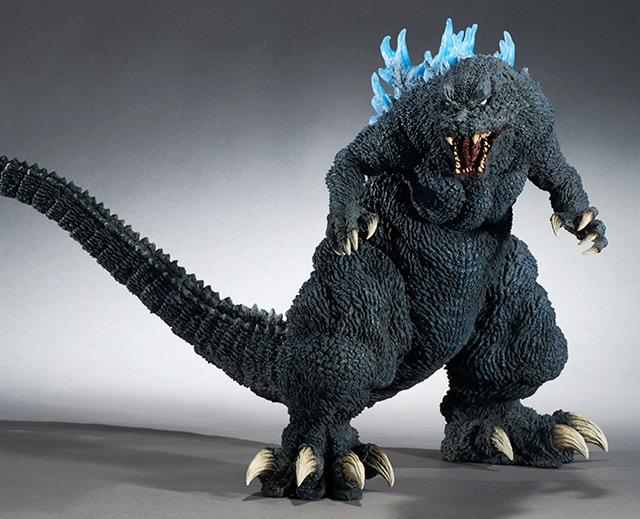 Today, Diamond Distributors made a whopper of an announcement: The Gigantic Series Godzilla 2001 (Blue Dorsal Fin Emission Version) vinyl figure by X-Plus will be getting a North American release. 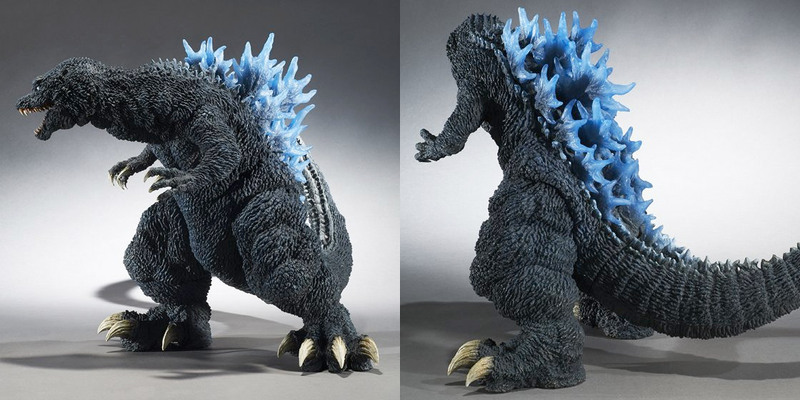 This figure (sans the blue dorsal fins) was the very first entry in X-Plus’ Gigantic Series which was released in December 2013. It was made available again in unfinished kit form. And, most recently, was reissued in Japan again with translucent dorsal fins (tinted blue) earlier this year. This latest re-issue is licensed for sale in the United States and Canada and is expected to come out in three short months. This reissue has a suggested retail price of $424.99 and was originally expected to ship in January 2017. It now has a shipping date of “To Be Decided”. 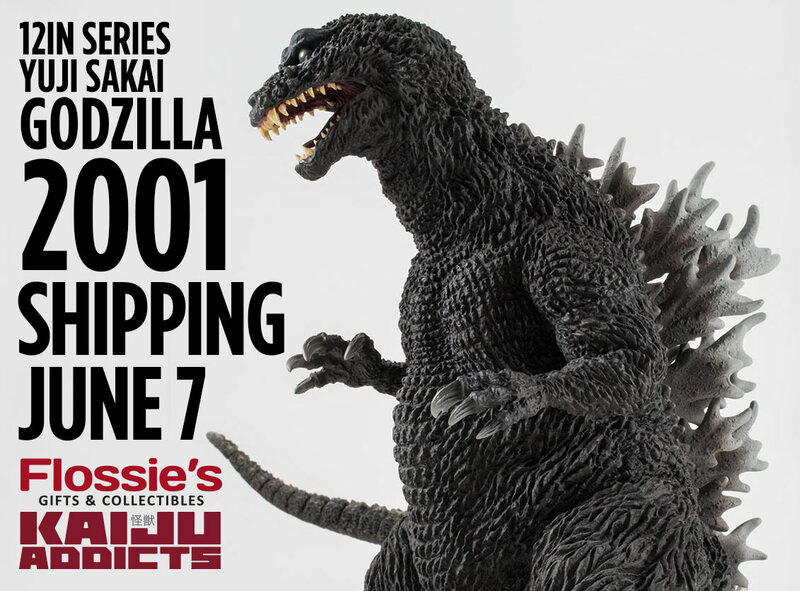 You can preorder the Gigantic Series Godzilla 2001 Blue Dorsal Fin Version vinyl figure at your local comic store and save big on shipping. Tell the guy behind the counter you want to order Item Code: AUG169272. You will also be able to order this from your favorite online retailer. Just give them time to catch on that it’s available. This news literally came out of nowhere. Pre-order this now for $378 at Flossie’s Gifts & Collectibles at a discounted price. 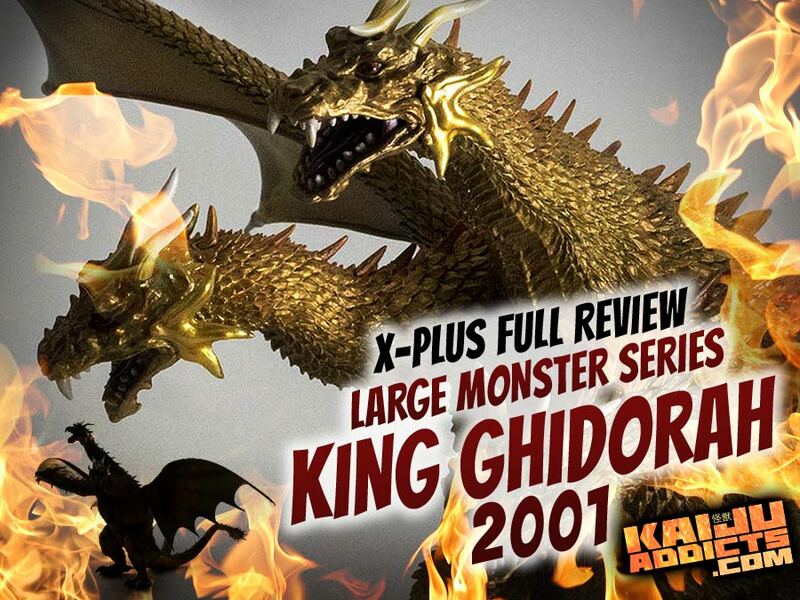 • See my Kaiju Addicts Review of the original Gigantic Series Godzilla 2001. • See High Resolution Photos of the Japanese (Blue Dorsal Fin) Re-issue at SciFi Japan. 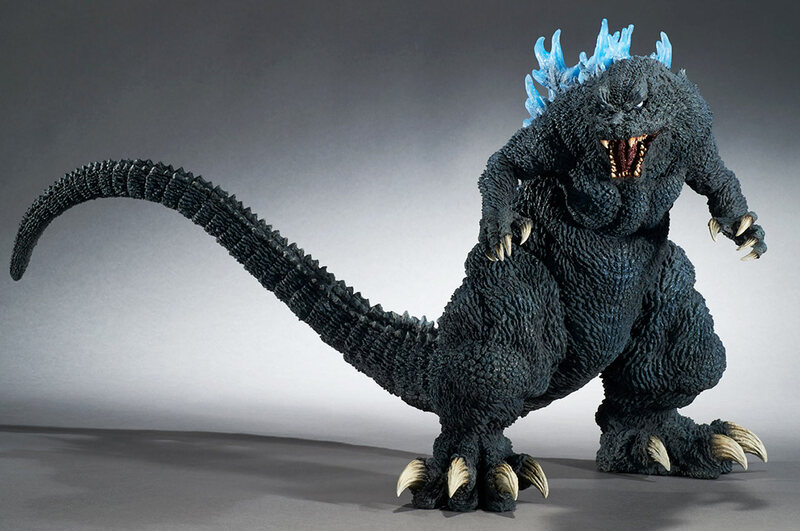 Gigantic Series GMK Godzilla 2001 Gets Re-Issue… and Blue Fins! 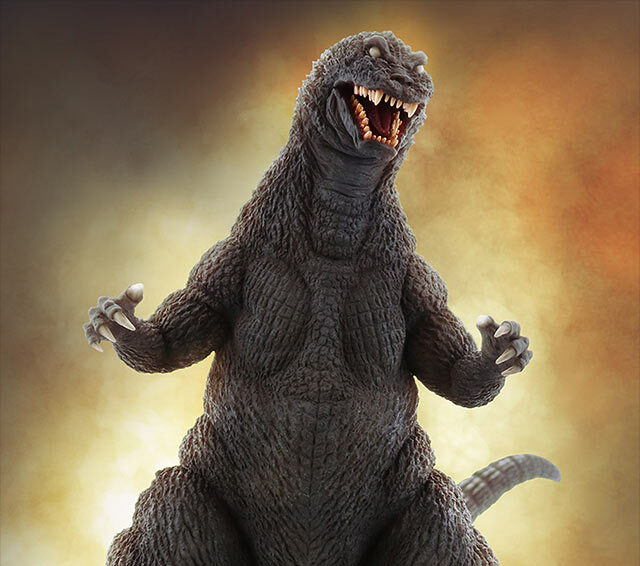 Back in December of 2013, X-Plus released the very first figure in the Gigantic Series: Godzilla 2001 (or GMK). This behemoth is 7 1/2 pounds of badassery. It is very detailed with a deep, intricate stylized sculpt which gives it an unparalleled fierce personality. It was later re-issued as an unpainted kit. Since then, it’s scarce presence in the aftermarket comes with a skyrocketed price. Also, I could be wrong about this, but there seems to be subtle blue highlights brushed over the body to make it even more unique. A bonus item will be included which will employ the Godzilla, Mothra and King Ghidorah: Giant Monsters All-Out Attack movie logo. More details on this extra will come later. This figure will set you back ¥37,800 (currently $344.54 USD). Pre-orders are being accepted right now at the X-Plus Ric Boy online store and from Premium Bandai. There is a limit of 3 figures per order. It will NOT be available from other stores (except later in the inevitable gray market and aftermarket). Shipping is expected to occur in September 2016. • More information (in Japanese) and photos are available at the Ric Boy site. • See my Kaiju Addicts Review of the original Gigantic Series GMK release. 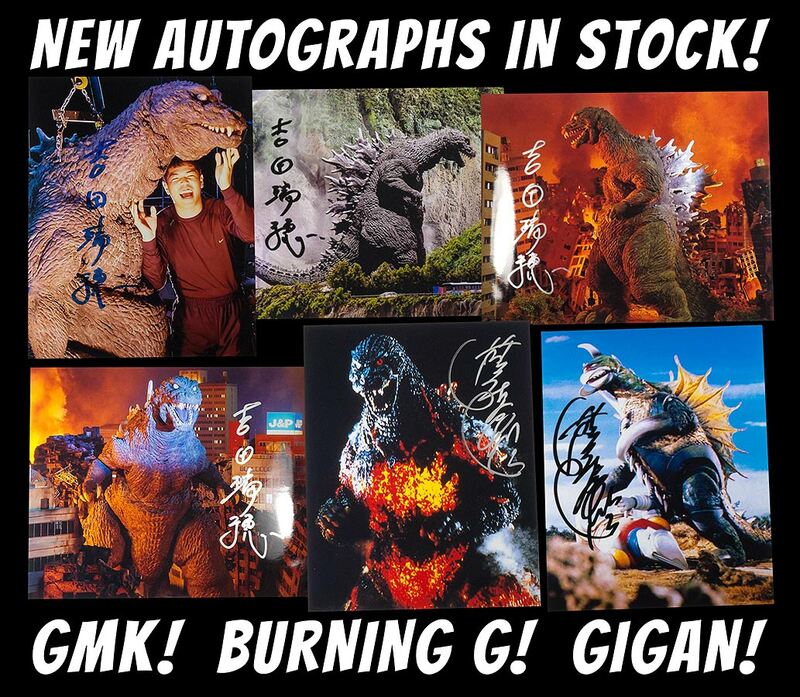 Fresh from Monster-Mania Horror Convention in Cherry Hill, NJ (just outside Philadelphia), for the first time: autographed photos of Mizuho Yoshida (GMK Godzilla suit actor, Legion, Dagahra)! 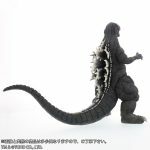 Plus we’ve restocked on Kenpachiro Satsuma Burning Godzilla pics and, for the first time, Gigan ’73! Click Here to Get Them at Flossie’s!